With over 2.3 billion active social media users worldwide, with a global penetration rate of 31%, it is more important than ever for businesses to be active on the same social media platforms as their customers. 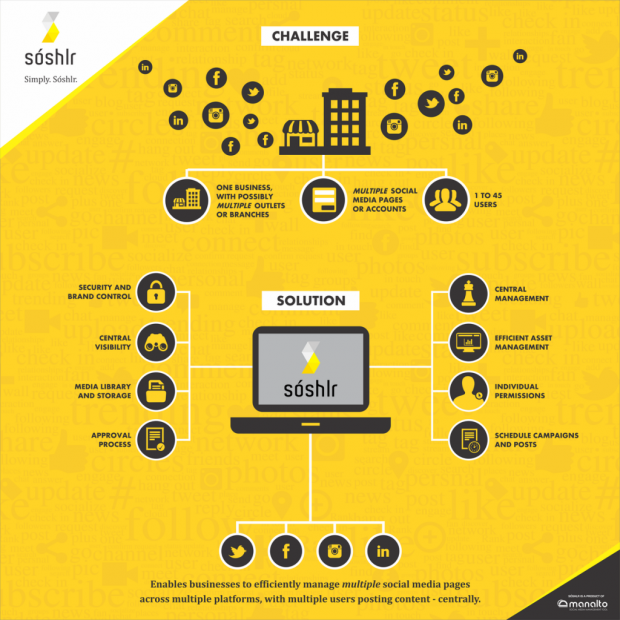 Sóshlr is a low cost, easy-to-use social media management solution built especially for SMBs. It makes it easy to work on social media pages with colleagues and offers intuitive navigation. Offer your customers a tool that allows them to harness the power of social media and start interacting with their customers. LuxCloud offers a one-stop shop for white label cloud business applications. Get a discount of up to 20% off of the Suggested Retail Prices and start to resell cloud services today! Sóshlr is a great add-on to Office 365, integrating with both Outlook and OneDrive. It creates a new Outlook calendar that lets you view, edit, delete and approve scheduled posts across platforms. You can also add images to your posts directly from OneDrive. Sóshlr also integrates with Dropbox for image storage. Easily choose your images from your Dropbox account and attach them to your posts. Offer your customers an easy-to-use cloud based social media management solution. Centrally manage and coordinate your social media presence across Facebook, Twitter, LinkedIn and Instagram from a single dashboard. 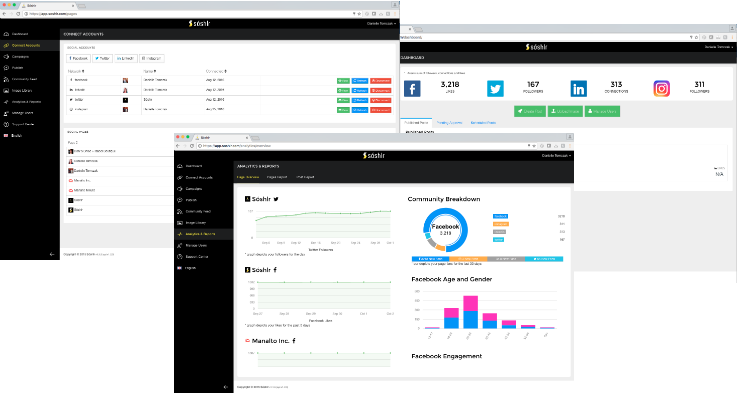 Centrally manage all of your social media accounts from a single dashboard. Protect your brand on social media with user permissions and brand controls. Easily schedule posts and campaigns across one or more platforms and pages in a few clicks. Get greater control over your content publishing with a built-in approval process. Store and share visual content and pre-approved links in the media library, to control exactly which images and content are published. View analytics on post performance and generate reports on posts or pages to track social media success. The Sóshlr Product Sheet provides information about product benefits, features and target market information. Meet Peter and his customer Emma. Emma owns multiple clothing stores and wants to manage their social media accounts. She has content she wants to post for all her clothing stores, but she also wants every store to have its own identity with local news and deals. Check out the video to see why she uses Sóshlr. The link to Sóshlr terms and conditions. Why do my customers need Sóshlr? Studies show it takes a midsize business about 32 hours a month to capably handle a single social media platform (Forbes.com). Finding adequate time to manage more than one social media page – either on the same platform or across multiple platforms can be challenging. Add to this, the challenge of coordinating multiple users, ensuring consistent branding and consciously engaging with their social media community to grow the business. Sóshlr enables a business to manage their social media presence from a single dashboard, with ability to centrally update, post content inside Facebook, Twitter and LinkedIn. An SMB can view community feeds across all managed pages and accounts on the platforms supported by Sóshlr. A business can control and view who has access to post, track activity and assign permissions, eliminating the need to grant direct access to their social media pages. How many social media accounts can I add to my Sóshlr account? Manage 1 to max 50 social media business pages or accounts across Facebook, Twitter, Instagram and LinkedIn from a single Soshlr dashboard. LuxCloud offers 4 different Sóshlr packages. Every package has its own amount of users and number of platform pages. Please check the available Sóshlr Packages. Do customers need to install software to use Sóshlr? Sóshlr is cloud based and accessed from a web browser, so there is no installation required. Sóshlr is password protected and each user has a unique login. As a business grows their social media presence, Sóshlr supports the growth. Sóshlr’s range of packages allows for more users and more pages. What security does Sóshlr have? Sóshlr uses best practice user login security and has built in individual permission capability to assign users specific tasks – read, review, edit and distribute. There are also built in approval mechanisms, which can be set up to ensure that posts are approved before being published. Why can a Sóshlr customer only monitor community feeds and view statistics on Instagram, and not post? Sóshlr’s Instagram driven functions are upgraded in line with Instagram’s public API releases. Currently, Instagram only offers viewing of community feeds and Instagram available analytics. Users can quickly view their Instagram statistics and feeds centrally in Sóshlr while viewing activity on all their pages, and access Instagram directly to post. Which LinkedIn pages does Sóshlr support? LinkedIn is a platform designed for professional engagement - both at an individual and business level. Sóshlr currently supports LinkedIn personal pages making regular engagement on LinkedIn easier. SMB professional services firms such as law and accounting firms will greatly benefit from having the ability for users to view engagement and post to LinkedIn using Sóshlr. Sóshlr has plans to support business pages in the near future.